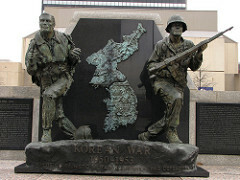 The Korean War began on June 25, 1950. It ended in July of 1953, after 5 million soldiers and civilians had lost their lives. Almost 40,000 Americans died in action in Korea and more than 100,000 were wounded. Here is a list of where to find Korean War records. The Korean War Veterans Memorial is located near the Lincoln Memorial on the National Mall in Washington, D.C. The memorial commemorates the sacrifices of the 5.8 million Americans who served in the U.S. Armed services during the three-year period of the Korean War. During that period, 36,574 Americans died in hostile actions. Of these, 8,200 are listed as missing in action or lost or buried at sea. In addition, 103,284 were wounded during the conflict.